It was a tad overcast and misty, when we woke up on our first full day in Luray. But we were determined to go for a hike at Shenandoah National Park and nothing short of a torrential downpour was going to stop us. I had chosen the closest motel I could to the park entrance, so we were there within 15 minutes. 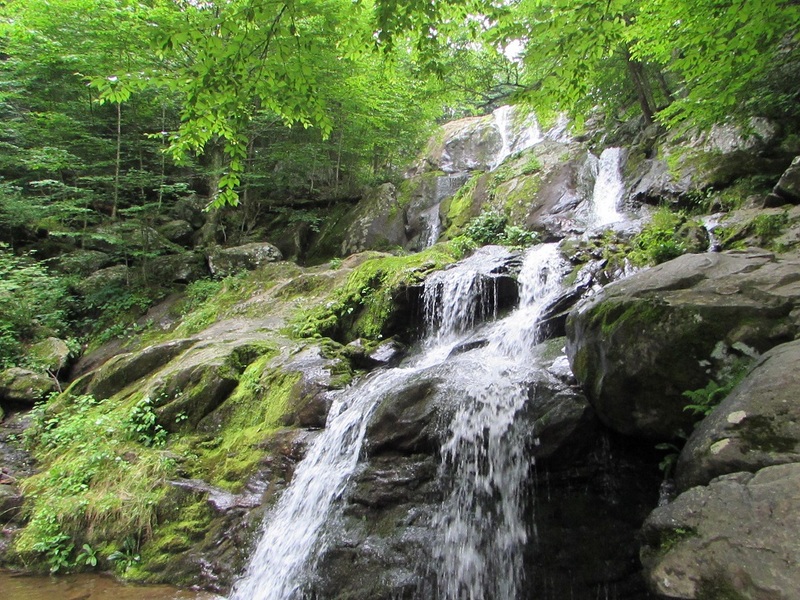 Interest in creating a national park in the eastern United States started at the turn of the 20th century and in 1923, the director of the National Park Service approached the Secretary of the Interior about establishing a park in the southern Appalachians. 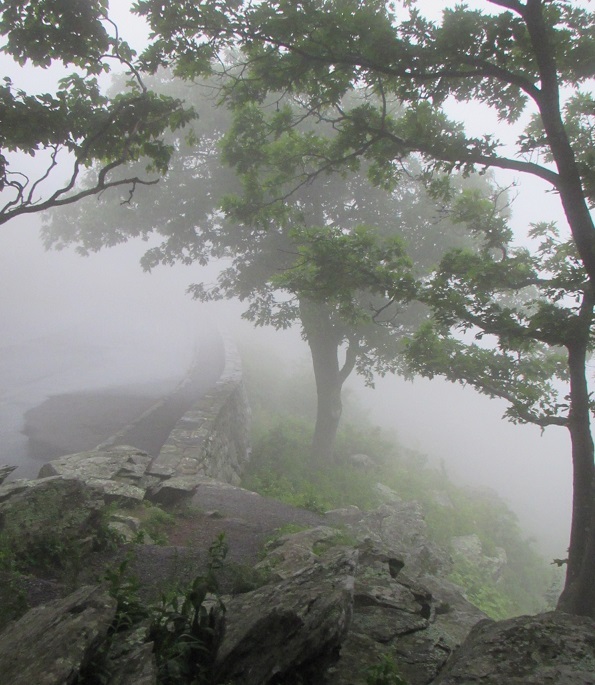 A committee was formed to study the issue and in 1925, Congress appropriated the funds necessary to begin development of the Shenandoah National Park. It officially opened in 1935. A story I learned when I visited the Smoky Mountains in North Carolina a few years ago: the land for the park was acquired by the government through eminent domain and many mountain families were displaced when it happened. In Virginia, local politicians and the business community supported the development of the Shenandoahs, because they saw dollars associated with it. But there was a group who wasn’t crazy about the idea, and that was the approximately 500 families who lived in those mountains. They were mostly subsistence farmers and laborers who worked in the valley apple orchards. The government tried to force the evacuation of all of the residents within the park but negative publicity (go Baltimore Sun!) forced a modification. In the end, most of the people just left on their own. Forty-two elderly residents were allowed to stay and 174 families were resettled by the government to communities outside the edge of the park. The ugliness came with the families who refused to leave — they were physically removed. All unoccupied houses were burned to prevent squatting. A similar story was happening at the same time further south, in the effort to establish the Great Smoky Mountain National Park. Much of the early development of the park happened during the Depression, so much of the park infrastructure was build by the Works Progress Administration. The WPA administered programs in which the unemployed were put to work on public projects. The park has beautiful stone walls, steps, bridges and buildings, all built by the WPA. We went to the park twice during our four day stay in the area. On the first day, we started with a 1.5 miles hike to the Rose River Falls. Then we veered off onto an adjoining trail, for more distance. It’s easily done and it made the trip a circle, instead of a down-and-back. 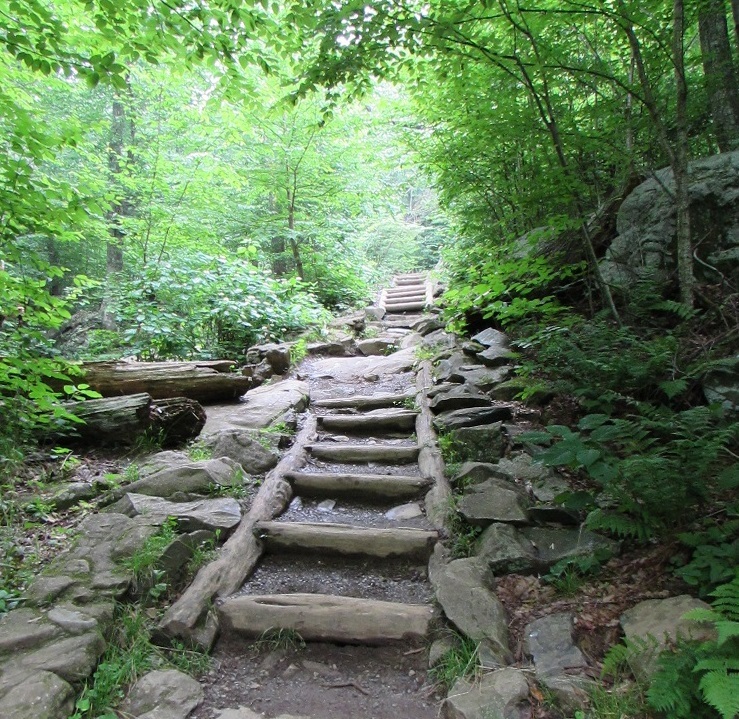 The next day, we started on the Stony Man trail, which is an easy 3-mile loop. Some of Stony Man is along the Appalachian Trail and we met a through hiker — someone who was hiking the entire 2160 mile trail from Georgia to Maine — when we stopped at one of the overlooks. He — a young man who looked to be in his early 20s — had started in Georgia just a couple of months before and was looking forward to reaching mid-point, in Harpers Ferry, West Virginia, in a few days. “I’m so tired of eating protein bars,” he said. The overlook where we met the through hiker, resting and eating his protein bar, is a popular one. I think I read somewhere that it’s the highest summit in the range, though I wouldn’t swear to that. 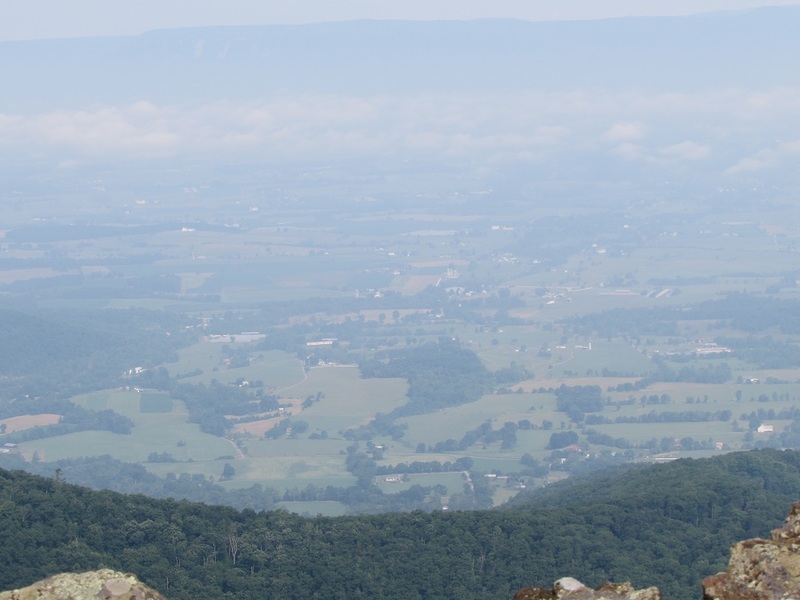 In any case, you can see the town of Luray, down in the Shenandoah Valley, and the Massanutten and Allegheny Mountains beyond. The morning fog hadn’t clear when we got there, so the quality of my photo isn’t the best. But I figured I couldn’t tell you about it without at least trying to show you. 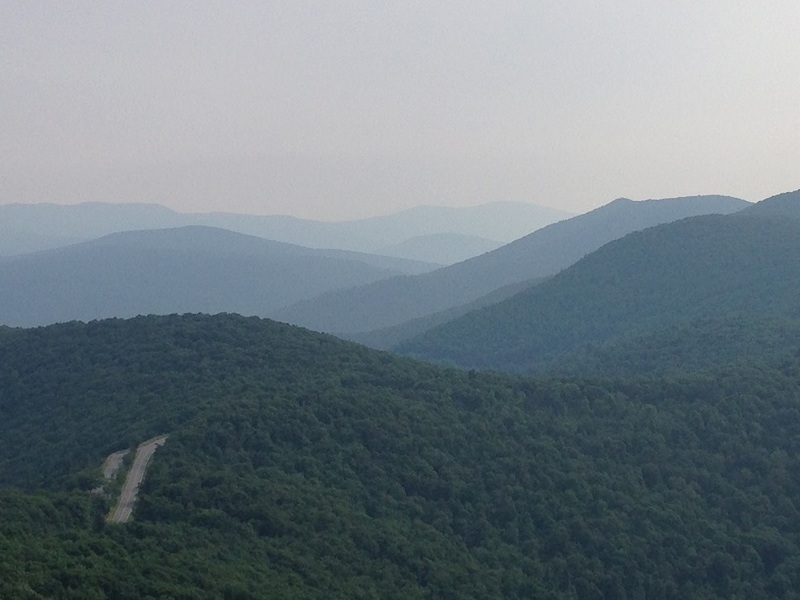 We turned off the Stony Man trail at some point, to head to Skyland Resort. There are several historic lodges in the park, run by an outside vendor, and the 1888 Skyland Resort is one. Patricia had written a guest blog about it the a couple of years ago so I wanted to see it. But it started to rain more heavily on our way and we ended up turning around. The rain perversely stopped almost as soon as we headed back, but we decided not to push our luck and opted for a dry hike straight back to the car. Gallery | This entry was posted in Virginia. Bookmark the permalink. Hard to believe there could not be some legal accommodation for people to keep them from being forced from their homes. No idea if they could do that today, but at least thru the 60’s there were instances of cruelty in the name of eminent domain. Read a heartbreaking article about the seizure of property in Vermont when they built a major highway. One old farmer was living alone on property that had been in his family since the 18th century. He had been born there and never lived anyplace else. The day they came to physically remove him, he was found dead in the barn, preferring suicide to being forced out. Wow – that’s a sad story. I remember first hearing about the government evicting people to create national parks when we were at the Smoky Mountains. 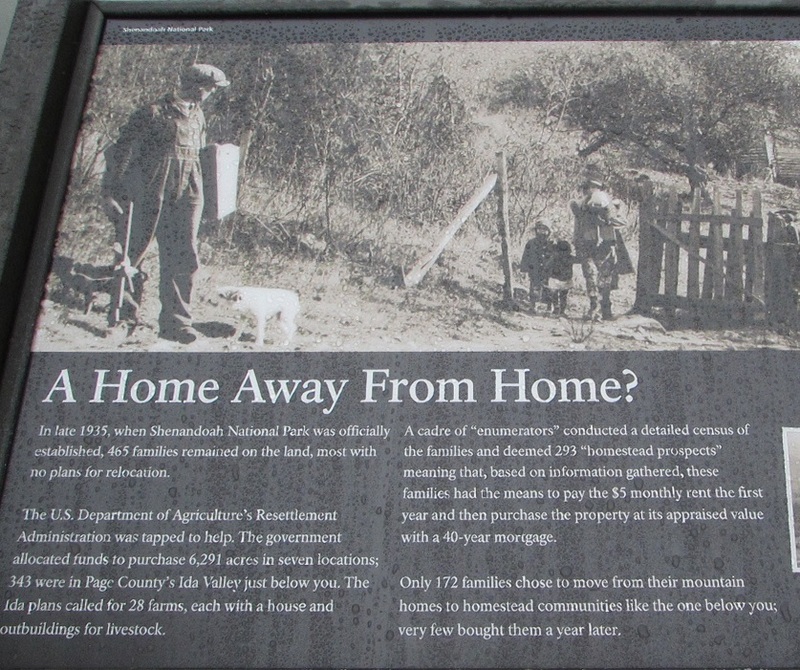 Its something I never thought about when I visited parks, but people were forced to leave their homes for them.